Panic prevailed in the city today after a person was shot dead in the busy Mehna Chowk market area in broad daylight. A shootout followed in which another person sustained serious injuries. The computer teachers are planning to hold district-level dharnas on September 12. In a press statement issued here today, president of the Computer Teacher Union, Bathinda, Balkaran Singh and general secretary Pradeep Kumar Maluka stated that the decision was taken during a state-level meeting held at Jalandhar. Popularity can beget wrong practices. It is the huge popularity of Punjabi cinema that has brought it at a crossroad where the impending obscenity will have to be fought against, said director Manmohan Singh, the man known for reviving Punjabi cinema to its present status over the last one decade. The star cast of the forthcoming Punjabi movie "Ajj De Ranjhe" paid tributes to their mentor, veteran film director Manmohan Singh, today. At a promotional visit to the Baba Farid Group of Institutions at village Deon, actors Rana Ranbir and Gurpreet Ghuggi charmed the youngsters with their witty jokes. Baba Farid Group of Institutions (BFGI) honoured teachers on the occasion of Teachers' Day today. A TB awareness workshop was organised today at Prince Public School, near Purana Thana, here. The awareness programme was organized under the Revised National TB Control Programme (RNTCP). District TB Officer Dr Ashok Monga was the motivator and Gagan Goyal was the communication facilitator for the workshop. The Department of Library, Punjab Technical University Giani Zail Singh Campus (PTUGZS), organized a workshop on "Printed word to digital text — Modern approach to reading habits" at its campus. Police said the incident was the fallout of a dispute between two brothers-in-law who laid claim to the property of their wives, both sisters. The murder today was the culmination of minor skirmishes that had been taking place during the last few days. The wives do not have a brother and their husbands were eyeing the property. Police said that Simarjit Singh Maur, son of Baldev Maur, died on the spot after receiving four bullet injuries in his body. He had come to get a licensed weapon repaired at a gun house in the market along with his friends Gurlal Singh, Varinder and Shammi. According to Kotwali SHO Jaspal Singh, the bullets were first fired by Bindu. Rana Bhupinder Singh Chahal, the brother-in-law of the deceased, identified the target for Bindu. A bullet hit Simarjit in his back. Three more bullets were then fired at him. After he collapsed, his friend, Gurlal, retaliated and fired at Bindu who was trying to flee. Bindu received a bullet injury near his shoulder and rushed towards a private hospital on the Barnala road along with his accomplice. Police came to know that the injured Bindu was admitted to a private hospital and deployed heavy force to keep an eye on the injured accused. Police said the doctors have termed the condition of the injured as critical. The SHO said Rana Bhupinder Singh Chahal is a resident of Ajit road and is in the cable TV business. He also has a car washing station near Ajit road. Police said a quarrel took place a few days ago when the two relatives entered into heated arguments and threatened each other with dire consequences. One group had reportedly lodged a complaint with the police in this regard. A case under sections 302, 148, 149 of the IPC and the Arms Act has been registered against Rana Bhupinder Singh, Ramandeep Singh Ramni of Mashana village, Gurinder Singh Bindu of Kotshamir and some unidentified persons at the Kotwali police station. Meanwhile, panic descended in the area as the shopkeepers and residents shut themselves indoors immediately after the firing incident. A shopkeeper said more than five rounds were fired and luckily, no passerby got injured in the shootout. Police has beefed up security in the city and heavy police force was stationed at all busy intersections like Ghorewala Chowk and Hanuman Chowk late in the evening. On September 12, dharnas will be held at the district headquarters and later, a memorandum will be submitted to the Deputy Chief Minister through the deputy commissioners in the districts. From October 7, state-level protest rallies would be held. The members of the union alleged that the decision to regularise the services of computer teachers was not being implemented in its spirit. During the meeting convened with the chief minister, computer teachers were promised all benefits that the other teachers were to be given but it did not happen. They demanded that the salaries of computer teachers be given on time. 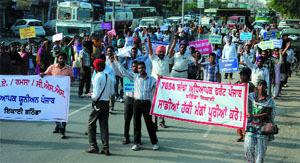 Among the other demand listed by the computer teachers was that Ravi Inder Singh, a computer teacher at Mansa, should be sent back to his home district of Bathind. The union also wants computer teachers to be be brought under the ambit of the education department besides the contributory pension scheme. The union said that civil service rules should be implemented taking in view their problems and facilities like leave for foreign tours be reinstated. The long list of demands also includes the granting of arrears from July 1 2011 onwards. In the city to promote his tenth Punjabi film "Ajj De Ranjhe", Maanji, as Manmohan is referred to in film circles, brought the "comeback" era for the Punjabi movies with his film "Jee Aaya Nu". Manmohan Singh said Punjabi cinema has attained that cult status wherein obscenity starts pouring in the form of C-grade cinema. He called upon the students of Baba Farid Group of Institutions, where he had come to promote his movie, to fight against such obscenity. "Whatever art you encourage, definitely finds its way back into your house. If young people support C-grade cinema, sooner or later, they will find their family members watching the same. The best way is to avoid and discourage it," he said. His "Ajj De Ranjhe" is the first ever Punjabi movie to be released in Pakistan where ten prints would be screened in ten cinema halls from September 7 onwards. The idea of releasing the movie in Pakistan had been in Manmohan's mind for many years. "We have 8 crore Punjabis in Pakistan — an audience potential that has largely remained untapped. It is after years of hard work, communication and persuasion that we have attained the feat of releasing our movie in Pakistan as well," he said. The movie will release on September 7 all over. He said in future, Punjabi filmmakers will have to come together in the form of associations and churn out co-productions, which could be taken to a wider audience such as in Pakistan. "Efforts like this (releasing the movie in Pakistan) do not bear fruit overnight. Our filmmakers will have to join hands to expand the horizon of Punjabi cinema," he added. Woven around the lives of those in Punjab Police, "Ajj De Ranjhe" promises to be a fun-filled family entertainer. It will have Aman Dhaliwal as the first action hero of Punjab from the modern genre. The movie has Gurpreet Ghuggi, associated with all the last ten Punjabi movies of Maanji, Rana Ranbir as actor and dialogue writer and the suave Chandigarh girl Gurleen Chopra. Actor Guggu Gill's entry into the auditorium was greeted with a huge round of applause and the youngsters thronged to get themselves clicked with their favourite stars. The stars also later visited the SSD Girls College on Amrik Singh Road. At Baba Farid College, director Manmohan Singh hummed his favourite melody, "Mere Pyar Ki Umar Ho Itni Sanam" from the movie "Waaris" where he sang with Lata Mangeshkar. Actress Gurleen Chopra was all excited about her role as a journalist in the movie in which she has been paired opposite Aman Dhaliwal of "Jodha Akbar" fame. Gurpreet Ghuggi will be seen in the role of a station house officer (SHO) who falls in love with actress Kimmy Verma. The movie will portray the Punjab Police in a completely different light by depicting the emotions among cops. This is the third move of Rana Ranbir as the dialogue writer, the other two being "Munde UK De" and "Ik Kudi Punjabi Di". After a brief role in "Ik Kudi Punjab Di", Aman Dhaliwal will be seen again in "Ajj De Ranjhe". Lyricist Amardeep Gill and actress Kul Sidhu of "Anhe Ghore Da Daan" fame will also be seen in the movie. It will be a cameo appearance for Amardeep Gill. The movie has been produced by Reliance Entertainment. The movie comes in a series of recent Punjabi film releases that have seen more modern themes and their ability to relate to the contemporary topics as well unlike the case earlier where traditional themes based on the socio-economic milieu were the order of the day. The audience response has also been overwhelming and has cut across the reginal and linguistic divide with people heading for the theatres. * Gurpreet Ghuggi will be seen in the role of a SHO. * The movie will portray the Punjab Police in a completely different light by depicting the emotions among cops. * This is the third move of Rana Ranbir as the dialogue writer after "Munde UK De" and "Ik Kudi Punjabi Di". * Director Manmohan Singh hummed his favourite melody, "Mere Pyar Ki Umar Ho Itni Sanam" from the movie "Waaris" where he sang with Lata Mangeshkar. Teachers of BFGI who were honoured on Wednesday. Associate professor, department of physics, Baba Farid College, HL Jasuja, principal, Baba Farid Public Senior Secondary School, Daljit Singh, vice- principal, Baba Farid College of Education, Kulwinder Singh, assistant professor, department of management studies, Baba Farid College of Management and Technology, Neetu Singh, senior lecturer department of humanities, Baba Farid Senior Secondary School, Geeta Arora and assistant professor, department of CSE, Baba Farid College of Engineering and Technology, Sunil Nagpal, were honoured and awarded Rs 21,000 each. 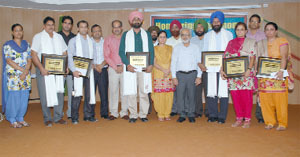 Gurmeet Singh Dhaliwal, Chairman, BFGI, honoured the teachers. The day was celebrated with great enthusiasm at the RB DAV Senior Secondary School. Students from the junior wing presented poems on the occasion emphasizing that a teacher illuminates the way to success of his students. The chief guest on the occasion was the principal, DAV College, Abohar, Dr Sanjeev Kumar Arora. He spoke about the changing perception of the "Guru" in today's times and said teachers should be the mentor of their students. School principal Dr SK Bhullar tanked those present. A blood donation camp was held at the Delhi Public School (DPS) to mark the Teachers’ Day. Teachers of the school lead by its principal Dr Arun Jee donated blood. The camp was organised by the Red Cross Society in collaboration with the United Welfare Society. memntoes were presented to the blood donors by the NGO. The principal thanked the Red Cross Society and the United Welfare Society for their cooperation. In a memorandum submitted to the Bathinda MP Harsimrat Kaur Badal through the Deputy Commissioner, the members of the union stated that the Supreme Court of India and various High Courts in the country have repeatedly made it clear in the M. Nagraj vs Union of India case in 2006 and other decisions that reservations in promotions are unconstitutional and are opposed to the soul and spirit of the fundamental right of equality. Sharma added that the central Government, under pressure from some quarters, has turned a blind eye towards the welfare of the poor and the needy from the other categories as well. The Federation alleged that the government was not taking care of the general category. "This has resulted in the creation of the Super Dalits," he added. District president of the Federation Shiv Pal added that the Government of India has also made many decisions of the Supreme Court defunct by amending the Constitution to provide for caste-based reservations. They stated that it was not in the best interests of the country and urged the MP to take necessary steps to prevent this. TB awareness workshop in progress at Prince Public School. The students and the school staff were informed about the symptoms, precautions and treatment like the DOT system and the DOT Plus system, for the disease. Goyal urged people to get their sputum examined in case anyone discovers the symptoms of TB like cough for more than two weeks, blood in sputum, loss of appetite, loss of weight and pain in chest etc. He said the sputum examination is done free of cost in government hospitals. The experts also appealed to the people not to leave the treatment midway. In case any patient gave up the treatment halfway, then the disease becomes incurable. So the patients should complete the course of the medicine, ranging from six to eight months, to get rid of the disease forever. The medicine is give free of cost under the Directly Observed Treatment Short Course (DOTS) in government hospitals and by DOT providers. Goyal warned people not to take drugs during this disease which can prove to be very harmful. The workshop was aimed at finding the reasons behind the decline in reading habits among the youths these days. Dean, Central University, Punjab, Prof Paramjit Singh Ramana, who is also the coordinator, School of Languages, Literature and Culture at the CUP, was the chief guest on the occasion. He elaborated on the development of literature and reading habits since the 18th century and mentioned that in ancient times, literature, especially material related to religion, was restricted to the domain of particular sections of society. Reading or understanding such text was supposed to be a sin for the others. Therefore, it took a long time for the reading habit to develop. He also emphasized upon the impact of modern gadgets like computer, internet and e-resources on reading habits. Director Dr Jasbir S Hundal also raised many important issues related to the use of library in this technological era. He expressed concern over the decline in reading habits among the youth and emphasised that libraries should have the latest and user-friendly literature in their stock. Dr Hundal also exhorted the faculty, staff members and the librarians of various institutes to motivate the students. He also congratulated the librarian of PTUGZS campus, Gurmeet Kaur, and the library staff for their hard work in making the workshop successful. 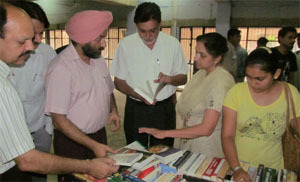 Prof Paramjit Singh Ramana also inaugurated the two-day book exhibition at the campus. Pearson Publication and Wiley Publication presented their e-books on the occasion. The head of the chemistry department Dr Gursharan Singh proposed the vote of thanks.